This comic however shows us a very different Barbra Gordon one who is rushed and driven in ways that I did't expect while some how still showing us glimpses of the woman she would eventually turn into in those new 52 comics that I have enjoyed so much. The pace of the story is fast and Batgirl is self assured from the start but her alter ego comes across far less skilled and early in the story forgets that she is supposed to be attending a funeral (a less than convincing plot device) I don't want to give you spoilers for the story but although flawed it's a very short experience that is completed in the pages within. On a whole, I liked it and it's interesting to see a more 'basic' Batgirl with no shock absorbing gloves and high tech trackers but a simpler and in many ways more skilled superhero. It's easy to see how this childish character eventually evolved into the Barbra we know and love in the New 52. 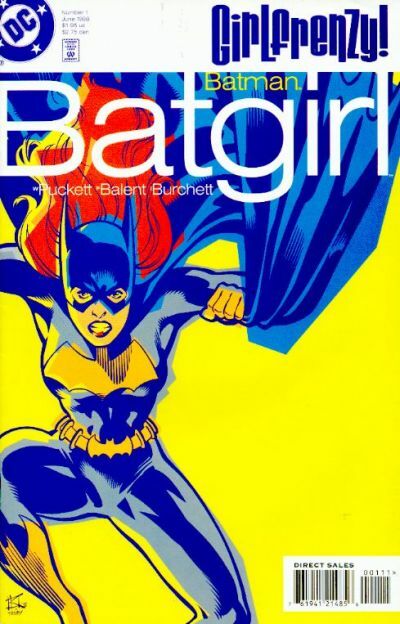 From the standpoint of artwork its a striking success with an intentionally basic cover that in my mind is mirrored in the first issue of the current run (Batgirl leaping towards the camera with a cheeky glint in her eye). The rest of the comic is in a richer style than the cover but is still quite basic compared to more recent DC titles. It is however what we have come to expect from 90's titles. It's simple but beautiful making sure its clear in every frame exactly whats happening while relying heavily on shadows to give the panels tone that it would otherwise lack. The actual placement of this in the Batgirl run is something of an enigma, the only thing in the way of a sequel I could find is a thicker issue with the same title from one year later (reading that tomorrow, thoughts soon) making me think that DC was not as committed to the character as we would have hoped. thankfully as this story stands well alone it's not a massive problem but I would love to read a mid 90's Batgirl series. My only criticism is that the cover shows the words 'Girl Frenzy' is fun pop-art styling. This story is not fun, its actually touching and a little dark and to stamp this rubbish on the front cheapens the character. This is worth a read and avalible on e-bay for reasonable prices as a whole, I would recomend it to any Bat-Family reader.